Telecommuters used to get a bad rap, seen as folks who lounge by the pool with a trashy magazine and a margarita on a Tuesday afternoon. But technology is making working from home a viable option for many industries. A Gallup poll found almost half of employed Americans, or 43 percent, spend some time working remotely. “Flexible scheduling and work-from-home opportunities play a major role in an employee’s decision to take or leave a job,” the report said. Today, more than 60 percent of organizations allow some type of teleworking, compared with a mere 20 percent just two decades ago. Not everyone is on board with telecommuting or even knows how to define it. WordPress.com, owned by Automattic, recently closed its physical San Francisco office because hardly anyone showed up in person. On the other hand, in 2013, Yahoo ended its work-from-home policy, and so did IBM last year, for thousands of its staff. 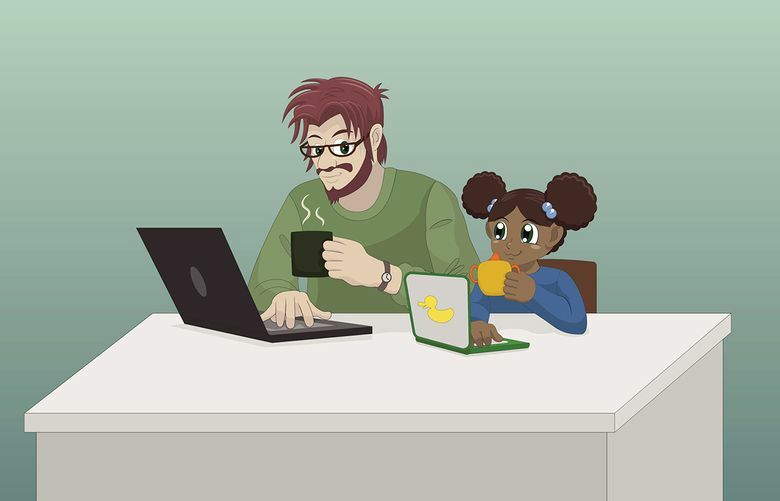 Telecommuting has lots of perks, especially for parents. We get to spend more time with family while staying on a career track, retaining an income and holding on to the jobs we love. No more two-hour commutes, no more fluorescent-light-flooded conference rooms. Remote work, however, isn’t without challenges. It’s incredibly important for people to interact with other people. Working from home can be surprisingly isolating. Some days, it may be possible to have not spoken to a single human, despite a ton of work correspondence and other “humanlike” contact, which may have, in retrospect, been just a scroll through Facebook and texting about dinner plans with a spouse. Even with a part-time schedule, I found that library singalongs and playdates often conflicted with work calls and deadlines. Although introverts are said to generally do better with remote work, extroverts can manage, as long as they schedule social activities after hours and even during the day: lunch or a coffee meeting, a trip to the gym with a neighbor, socializing after the kids are in bed. Guilt runs deep if there’s work to do at odd hours and kids are in the house. (Just think of that dad during a BBC interview, video-bombed by his little cherubs on live TV.) My heart breaks thinking of the times my baby watched videos while I had my back turned to him, drafting an urgent email. Or when my toddler invited me to join her doll’s tea party in the other room and I declined in order to finish a client report. Likewise, even if you’re exceeding goals at your job like nobody’s business, you might feel the need to overcompensate. It’s easy to forget that office people often take lunches and coffee breaks, too, and that these things are not only OK, but also necessary. When you work from your home, you work all the time and everywhere. No, really. It’s incredibly hard to draw boundaries between your personal space and workspace, and the same goes for your time. You’ve probably worked in the kitchen. Taken conference calls in the preschool parking lot. Typed emails in the grocery store and during dinner, checked email in the middle of the night – and maybe in the bathroom. You are always available. I’ll never forget my day off, when I finally made it out on a playdate. The host, a fellow mom, later shared event photos. The photos capture an idyllic scene: 1-year-olds finger-painting or waddling around with toy trucks as their mothers chat on the nearby couch. And then there’s me. I’m standing at the top of the staircase, away from everyone else and yelling something into the phone, as my son is grabbing my leg to get my attention. It’s crucial to create realistic boundaries, preferably informing your partner, too. Even if these rules will be broken, which they will. Some examples are stashing the phone and computer away from the time you pick up the kids to when you put them to bed and designating times when you are offline, barring an emergency or a deadline. You’ve probably worked in pajamas. Maybe you thought, I’m just gonna power through and get this thing done, and then I’ll put on my nicest “outside” outfit, do some downward dogs and feel spiritually whole again. Except you look at the clock and it’s already time to pick the kids up in three minutes. And the significance of the day’s activities may have not sunken in the same way as it would in a more traditional environment. Our professional identities are often tied to the physical manifestation of an office, colleagues and even work clothes. In absence of that community, I found it’s important to retain hobbies, get involved in organizations and stay socially connected to avoid feeling like an untethered balloon. Admittedly, it isn’t an easy feat in between deadlines, dishes and diapers. Though working from home is practical and rewarding, it requires discipline and self-awareness to ensure that our work works for us. Masha Rumer is a writer and a communications professional, as well as a mom of two toddlers.